Happy New Year! 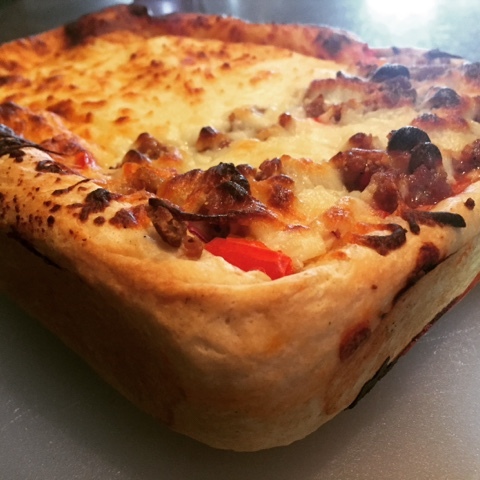 My first post of the year should hopefully help fulfill some of your new year resolutions….budget friendly, tasty, and waistline friendly. 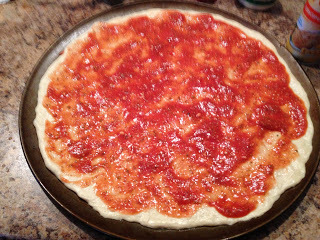 The homemade pizza I make all the time…I know you’ve been waiting for this recipe. I have experimented a lot and this one really is good. Let me share! —-you can also “cheat” and just buy a jar of marina sauce. Aldi has a great organic marina. Now that looks and tastes delicious! 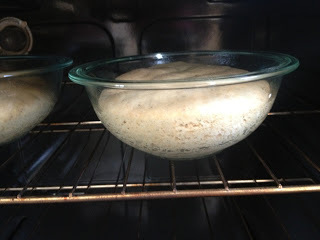 1. pour 1/4 cup hot water with 2 1/4 tsp yeast. Let sit a couple minutes. 2. 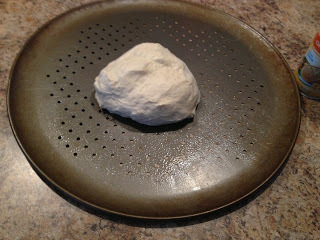 Add 3/4 cup room temp water with flour and olive oil. 3. 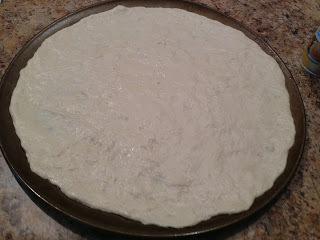 Mix together and then knead on counter for about 5-7 minutes and use more flour so it doesn’t stick. 4. 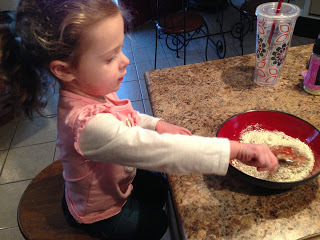 Once soft and not sticky, put in greased bowl. 5. 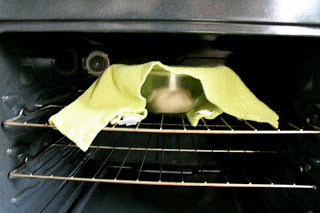 Let rise 1 1/2 to 2 hours with a towel overtop in oven or warm draft-free place. 6. Take out, punch down and put on pan. 7. 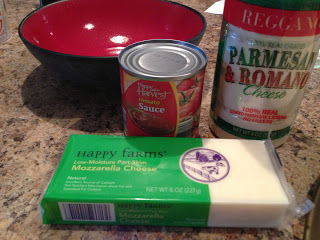 Mix sauce ingredients in bowl. Spread over pizza. 8. 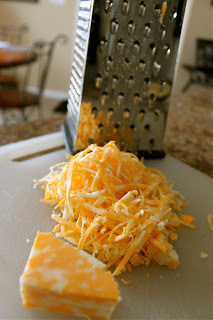 Grate cheese and add on top. 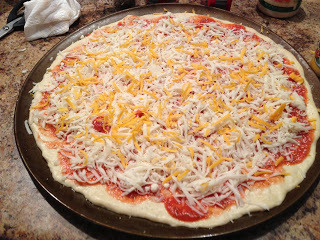 Add other toppings if you want. 9. Cook in preheated oven of 400 degrees for about 18-20 minutes. I have success every time and everyone who eats it loves it. 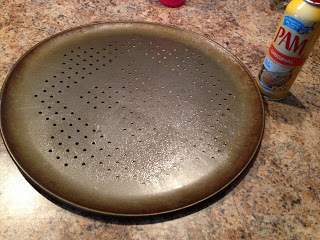 I like using a pan with holes because I think the crust cooks very nice. 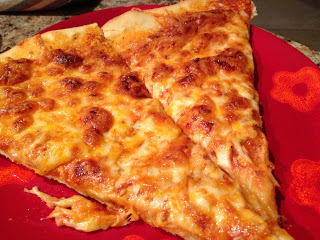 Pizza Hut cheese Pan pizza is 390 calories for same amount!!!!!!! There you have it. 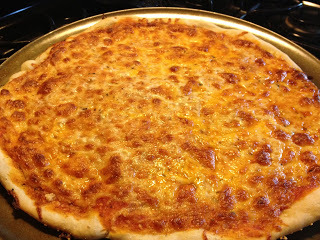 If you are a pizza lover then stop ordering out so much and start making it at home!! 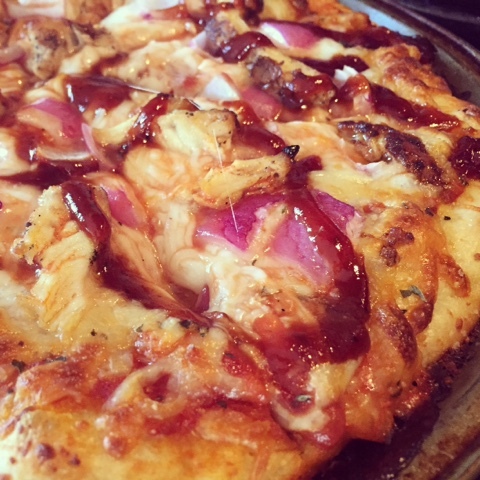 For bbq chicken pizza, add cut up chicken breast already cooked (grilled and seasoned is the best), red onion, and squirt bbq sauce on top. 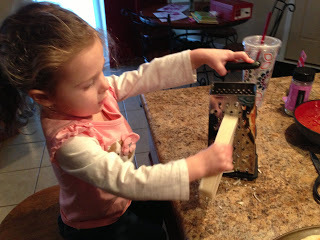 Brush the crust with some olive oil or melted butter and sprinkle garlic salt…beat any pizza place’s specialty pizza!